seven × = seven Required Please enter the correct value. 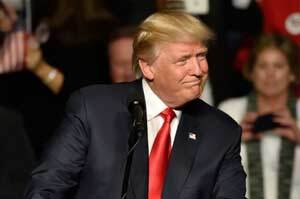 President Donald Trump may delay one of his campaign's chief economic promises until 2018, according to a report released earlier today (Feb. 23). Citing Republican sources, Axios Media Co. claimed that the new POTUS will likely move his proposed $550 billion infrastructure spending plan back a year in order to address other policy issues his administration considers more pressing. "There are an overwhelming number of reforms that the Trump team is pushing [first]," the reported stated. "We're doing the healthcare — again moving along very well — sometime during the month of March, maybe mid-to-early March," the president told reporters Wednesday. "We'll be submitting something that I think people will be very impressed by." Disagreement among congressional Republicans in recent weeks over how to replace the 2010 law have led to jeers from conservatives who expected to kill the law immediately and liberals who say the GOP doesn't have an adequate replacement plan. GOP lawmakers have likewise been heckled by constituents at town hall meetings across America this month as they struggle to outline a clear and smooth path to a better system. The public's mounting concern — as well as struggles within the GOP party itself — over the future of U.S. healthcare is keeping ACA reform at the forefront of Washington's agenda.